Gladys Nilsson (BFA 1962, HON 2016), "Star Bird" (1968). Courtesy of Larry and Evelyn Aronson. Via "artnet"
SAIC alums have been featured widely in upcoming fall visual arts events in publications such as artnet, Chicago Sun-Times, and ARTnews. 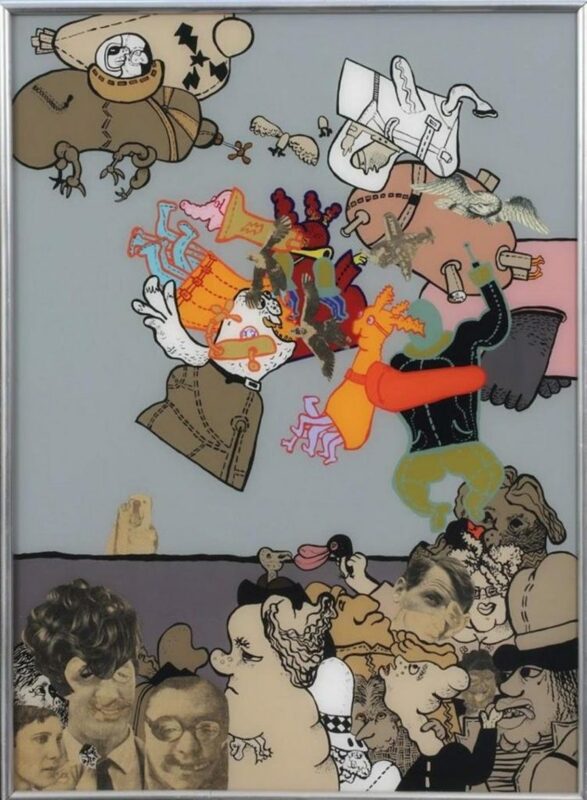 The renowned Chicago Imagists group the Hairy Who’s “first-ever major survey exhibition,” titled Hairy Who? 1966–1969, featured in all three publications’ listings. The Hairy Who members include Jim Nutt (BFA 1967, HON 2016), Art Green (BFA 1965, HON 2016) , Suellen Rocca (BFA 1964, HON 2016), Jim Falconer (BFA 1965, HON 2016), Gladys Nilsson (BFA 1962, HON 2016), and Karl Wirsum (BFA 1962, HON 2016). The show will be held at the Art Institute of Chicago on September 26, and have 225 paintings, paper-based work, sculptures, and ephemera. The Chicago Sun-Times mentioned another exhibition called the Figure and the Chicago Imagists: Selections from the Elmhurst College Art Collection, curated by Hairy Who founding member Suellen Rocca (BFA 1964, HON 2016), and currently on view at the Elmhurst Art Museum. Barbara Jones-Hogu's (BFA 1964) work is featured in The Time Is Now! Art Worlds of Chicago’s South Side, 1960–1980, at the Smart Museum. EXPO CHICAGO, which will feature the work of many alums and faculty, was also called out as an "essential stop on the international contemporary art circuit," by the Sun-Times. Also making the Sun-Times list was AfriCOBRA 50 curated by founding member of the artist collective, AfriCOBRA, Gerald Williams (BFA 1951) and featuring the work of fellow founders Jeff Donaldson, Jae Jarrell (SAIC 1959–62), Wadsworth Jarrell (SAIC 1958), and Barbara Jones-Hogu (BFA 1964). The upcoming exhibit, Ando and Le Corbusier: Masters of Architecture at Wrightwood 659 designed by Pritzker Prize winning architect Tadao Ando was also featured. The exhibit will present the work of SAIC students enrolled in the class Seems Real, On the Surface on the fourth floor of the gallery. Judy Chicago (HON 2018) is one of the many SAIC community members featured in the group show to be held at the Museum of Contemporary Art Chicago later in the year, highlighting West Coast artists’ Midwestern connection called West by Midwest. Gallery 400’s show Chicago New Media 1973–1992 will shine a light on Chicago artists’ crucial contribution to the development of new media and video games, and opens in November curated by Associate Professor Jon Cates and featuring works by Ellen Sandor (MFA 1975, HON 2014), Azadeh Gholizadeh (MFA 2012), and the late John Dunn (MFA 1977) among others. ARTnews listed an ongoing Sanford Biggers’ (MFA 1999) exhibition at Contemporary Art Museum, St. Louis, which will feature his latest series BAM, alongside his other paintings. Claes Oldenburg (SAIC 1951–54) numbers among the many luminaries included in Judson Dance Theater: The Work Is Never Done to be held at the Museum of Modern Art in September. Kerry James Marshall (HON 2017) will participate in Carnegie Museum of Art’s annual international group show Carnegie International 2018, which will open on October 13. Per artnet, Georgia O’Keeffe’s (SAIC 1905–06, HON 1967) lesser known later work will be displayed at University of Virginia’s Fralin Museum of Art for an exhibition titled Unexpected O’Keeffe: The Virginia Watercolors and Later Paintings.